John Fitzgerald Hibbert is the late son of Edward and Dorrel Hibbert. Prior to his death in 2008, John was a flight attendant for American Airlines and had devoted much of his free time and disposable income to take care of orphan children in the Dominican Republic. John was well known by some but also unknown by many others. The John Fitzgerald Hibbert Award is presented in memory of its namesake to the person in the family that was unknown to most, but has grown to become a valuable resource to the family. 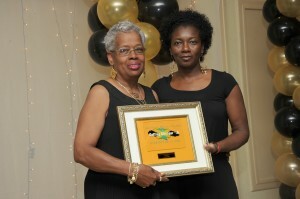 The recipient of this award has been a pioneer in her family. She has a quiet way about her but a vital and unstoppable force when work needs to be done. Over the years we have gotten to appreciate her wisdom, guidance, and advice. Many of you, here today, can attribute your presence to her will and determination for you to be here. We have found that she gives from the heart and loves from the soul. She has an old spirit and commands the respect of us all. Four years ago we did not know her. But once we met, at the 2007 reunion, we could never forget her. She embodies the spirit of what these reunions are about not only in pictures but also in her style and enthusiasm. To put it simple, she is contagious. We want to thank her for her powerful spirit and undying love for the family. We are delighted that she belongs to us. The recipient of the first John Fitzgerald Hibbert Award is Lucila Welch.